The Slovak round of the competition Chivas The VENTURE which has been in search of a startup entrepreneur with the most extensive social impact, just picked eight shortlisted candidates who made it to the finale. They proudly presented their business projects to the grand jury and the public. 50 startups from all walks of business such as Information Technologies, health care, catering, and environmentalism just to name a few, registered in the competition in the first stage. The jury made of Lukáš Alner, Šimon Šicko and Juraj Porubský carefully assessed all 50 registered projects and after meticulous consideration picked the best eight shortlisted candidates. „All registered projects are a proof that we too have entrepreneurs in Slovakia who are willing to go beyond the call of duty to be beneficial to our society. The effort of all participants of the competition Chivas The VENTURE is highly appreciated, thank you all for taking the time to register,“ Matúš Kollár, the Brand Manager of Chivas Regal shared his opinion. The jury went all out to pick the one project with the most gripping idea behind it with the highest potential and obviously exceptional social impact out of a plethora of fascinating projects. „Social responsibility while conducting business in Slovakia is not trending so much these days, so I’m excited to be part of a project that promotes similar ideas and raises awareness of activities like that. We are also glad to see so many people taking an interest in registering their startups for our competition. I would like to point out that from the business angle some projects were more sophisticated, while others might not get picked to make it to the finale. We shortlisted eight candidates, we felt they possessed the greatest potential and the real chance to be appreciated even on a global scale. 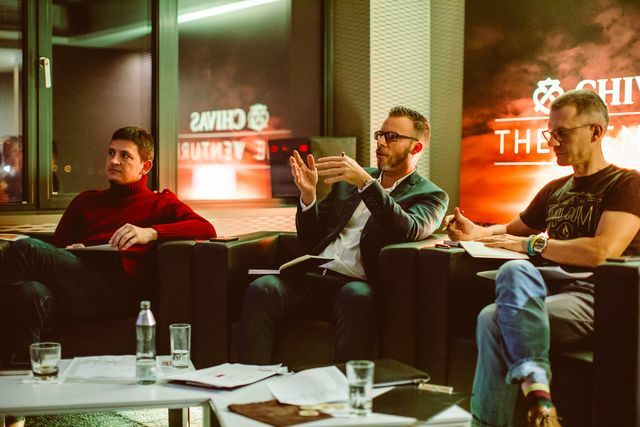 Needless to say, the personality of the entrepreneur behind the idea itself is just as important, especially when it comes to the way they can present and sell it“, Lukáš Alner, one of the jurors and the Ambassador of the competition Chivas The VENTURE clarified further. Tomáš Szabo representing his company Prorozvoj is offering small towns and cities a vehicle to simplify the planning of development and community management through the project E-pro. Jozef Čuha is assisting people over 50 of age with finding a job through his crowdfounding campaign SilverStartUp. Róbert Božík with his project Exon has developed a monitoring and alarm system used in buses to avert accidents and prevent casualties. Edita Bednárová has been planning to build a coworking centre called Hajcman with the intention to inspire young people to stay in the region they grew up and develop it with a common effort. Matej Brečka with his project Karmadilo is working on a research panel and data collection provided by respondents which transfers the reward for every questionnaire to the bank account of a non-profit organization using an application. Filip Baďo has presented his project Ekočističky, which is a highly efficient wastewater processing technology with no energy consumption and minimal operating costs. Ivan Daško from GrandPano is offering a concept that can help people overcome their phobias utilizing virtual reality. The winner will be announced at a gala event taking place 20th December. Apart from winning a bottle of fine Chivas Regal, he/she will be given the opportunity to present him/herself in the monthly Forbes with the grand prize being an invitation to the Chivas The VENTURE accelerator week in Oxford, UK held next spring. The winner of the Slovak round will have the chance to meet winners of the local rounds from all around the world. The shortlisted candidates can show off with all they’ve got to compete against each other next July in the global finale of Chivas The VENTURE final pitch whose winner will be entitled to their share of a million dollars as a reward for their project!